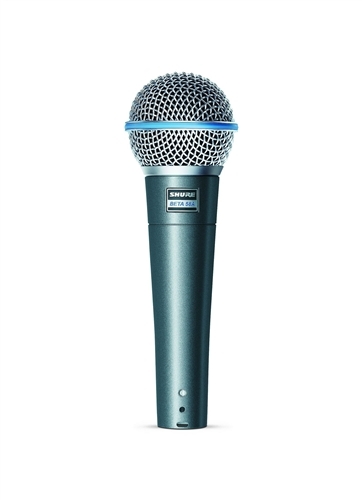 The Shure BETA®58A is a high-output supercardioid dynamic vocal microphone designed for professional sound reinforcement and project studio recording. It has become a leading choice among vocalists and touring professionals worldwide. The Beta 58A maintains a true supercardioid pattern throughout its frequency range. The Beta 58A has a shaped frequency response that is ideal for close-up vocals. 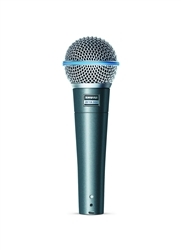 The superb performance of this microphone is not affected by rough handling because of its rugged construction, proven shock mount system, and hardened steel mesh grille. Polar Pattern: Supercardioid, rotationally symmetrical about microphone axis, uniform with frequency.